Wyomingites have demonstrated a desire for healthy, open landscapes, vibrant communities, and growing economies. The Wyoming Open Spaces Initiative is a long-term project designed to support working landscapes for agriculture, wildlife, and sustainable communities through applied research, information, education, and community-based decision making. The Open Spaces Initiative is a collaborative effort of the Ruckelshaus Institute of Environment and Natural Resources, the Wyoming Geographic Information Science Center, the Department of Agriculture and Applied Economics, the Department of Geography, University of Wyoming Extension, and the Wyoming Natural Diversity Database. The initiative supports Wyoming citizens' effective maintenance our state's open spaces through research, information, education, and decision-making assistance. The research group considers agricultural sustainability, community planning and development, wildlife, and other related cultural, economic, and environmental issues of importance to Wyoming. Meet the Wyoming Open Spaces Committee members. 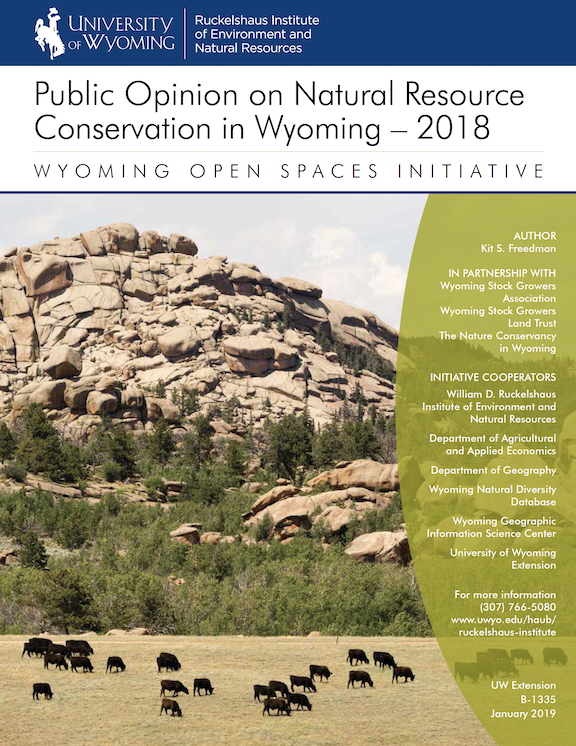 Public Opinion on Natural Resource Conservation in Wyoming — 2018 by Kit S. Freedman, summarizes findings from a recent survey of 600 likely voters in Wyoming on topics related to conservation and natural resources in the state. 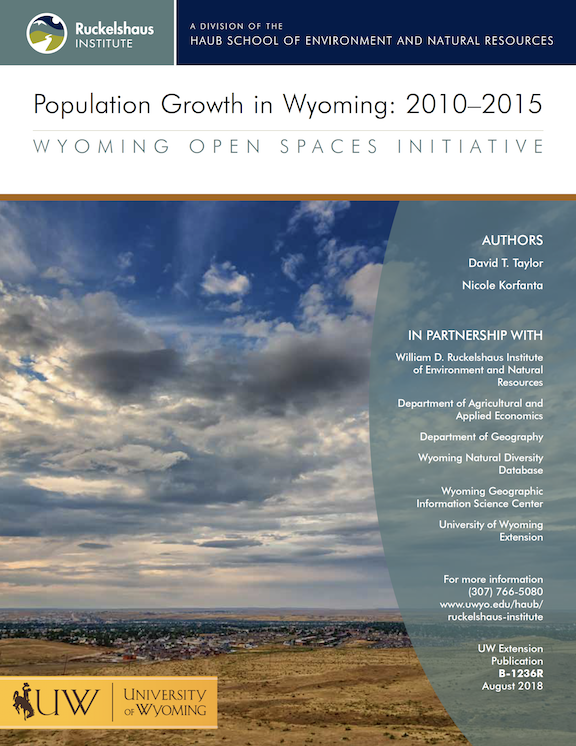 Population Growth in Wyoming: 2010–2015 by David T. Taylor and Nicole Korfanta, uses U.S. Census population estimates to explain changes in population growth patterns at the municipal, county, and state levels in Wyoming. 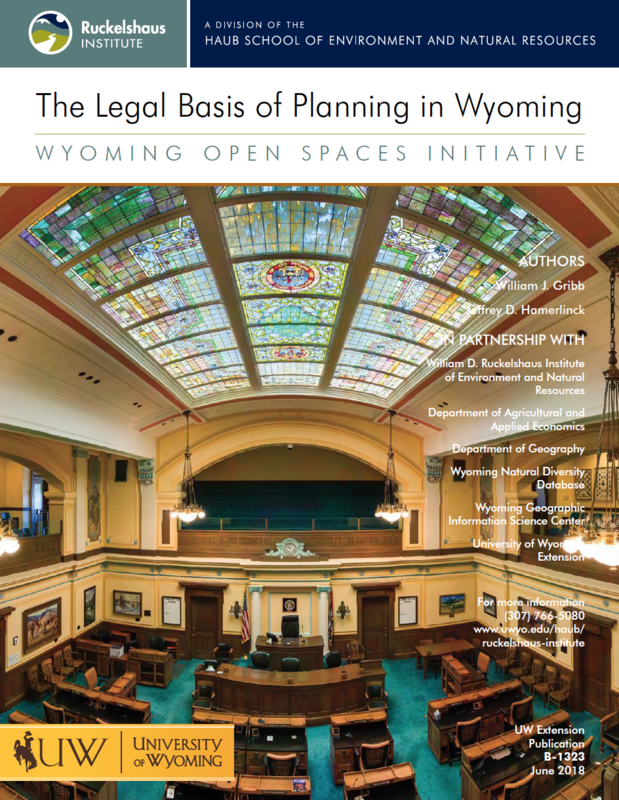 The Legal Basis of Planning in Wyoming by William J. Gribb and Jeffrey D. Hamerlinck provides an overview and basic background of laws that guide land-use planning the state. Wyoming Conservation Easements: Lands, Services, and Economic Benefits by Nicole Korfanta, Benjamin Rashford, Amy Pocewicz, Eric Schacht, Bo Alley, and James Luchsinger, provides an inventory of conservation easements in Wyoming and the types of lands and services they protect. View an online interactive version of the report. 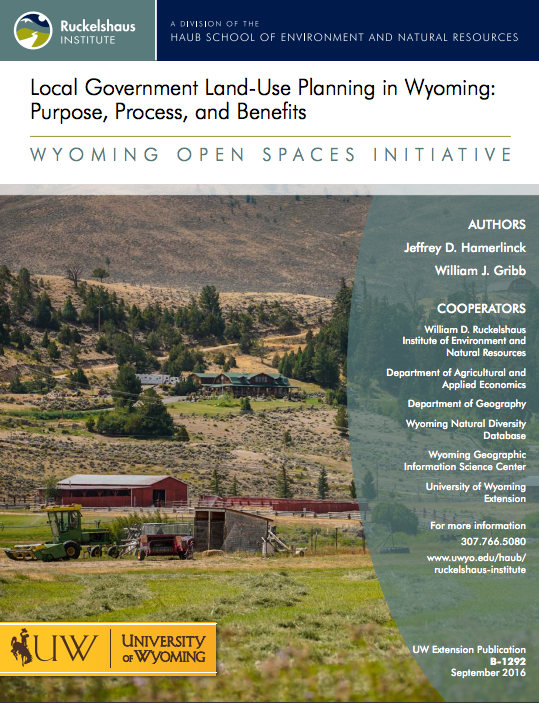 Local Government Land-Use Planning in Wyoming: Purpose, Process, and Benefits by Jeffrey Hamerlinck and William Gribb is the second installment in the Open Spaces' Land-Use Planning series. This document provides information to help citizens better understand and engage in the planning process in their local communities. A new report from the Wyoming Open Spaces Initiative shows that investment in private lands conservation yields broad economic benefits for Wyoming communities. 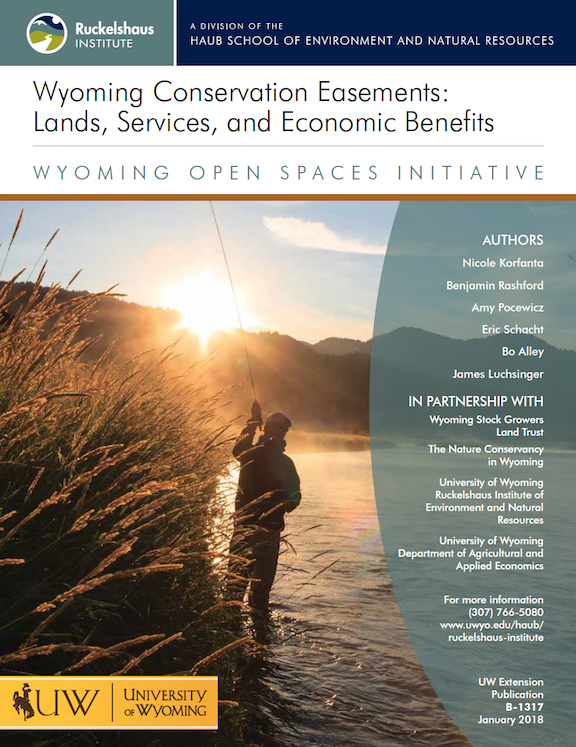 "Wyoming Conservation Easements: Lands, Services, and Economic Benefits," finds that the values derived from conservation easements on private lands flow across property boundaries to generate a host of public benefits. Download the print version: "Wyoming Conservation Easements: Lands, Services, and Economic Benefits"
View a promotional video featuring illustrations by Ruckelshaus Institute Communication Fellow, June Glasson.